Ridewell suspension with front axle lift. Saves tires and brakes. Ridewell 25,000# parallel spindle bearing axles. Top Quality. Custom Hoist Adjustable packing and Thicker wall tubes. You get far longer life. With outboard cylinder the Kingpin sits forward of the front wall. This means you meet what ever Fed Bridge you need with shorter body. Example our 39” trailer has a 36’ 8” box length. 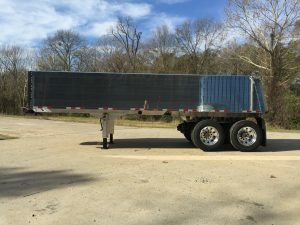 If you want a 30’ trailer. The box will be about 3Ft Shorter. Tell us the Yardage you need and we adjust the side height. When aluminum is welded, 80% of its strength is lost. Yield strength drops from 35,000 psi to 8,000 psi. Drilling and bolting do not anneal the aluminum alloy. T6 temper is maintained throughout. Bolted joints allow flexibility whereas welded joints are rigid and often crack. No two welds are the same. Welding parameters and workmanship often lead to porosity, undercutting, etc. Drilling and Huck bolting give a reliable, consistent result. 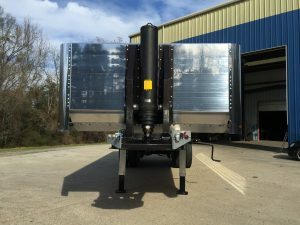 Repairing a damaged Hicks trailer is significantly less expensive than a welded trailer. Remove the bolts, replace the damaged parts, reassemble. Two great examples of bolted structures are truck frames and bridges. Neither would survive their expected lives if they were welded. 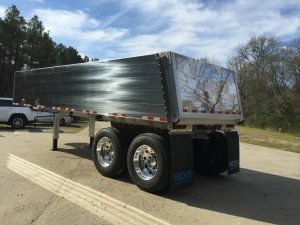 It’s time to make a dump trailer the right way. A 12-foot wide UHMW Combo liner is 1/2” thick in the rear 4 feet where all liners wear out. The subframe is constructed of trapezoidal members. Extensive FEA’s and road testing prove it to be a durable component in the highest stress area. To be able to gross 80,000 lb. 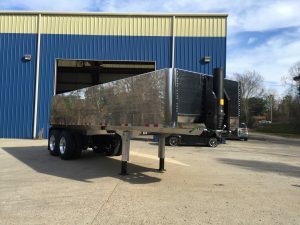 the trailer needs about 427” from kingpin to rear axle. The Hicks design does that with a shorter box to keep material from accumulating in the hoist housing area. The 93” wide inside width is standard allowing lower sides and CG, therefore increased rigidity. The 3.5” wall depth (vs 1.5”-2.0” with other manufacturers) gives greater torsional strength, therefore increased rigidity. 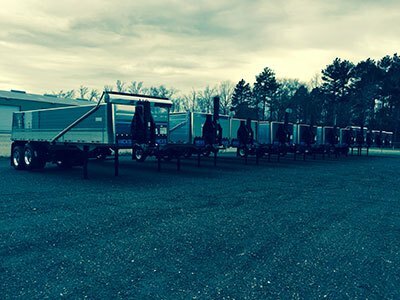 Fill out your information below and we'll respond promptly to give you more information about our Hicks Trailers.